No great record can be accomplished without the use of a great monitoring system. That is a fact. That is the reality. Underestimate the purpose of the monitoring system in the studio environment, and one is certainly laying ground for frustration and possible disaster. A great monitoring system provides the music producer with a clear view of how he can explore musical ideas without experiencing what can become an unexpected surprise later on. In the end, a music producer mainly relies on his own ears when creating a great piece of music, but prior to that he needs to be able to rely on his own studio monitors. Fortunately, it’s not a lack of options that is stopping one from owning a great monitoring system nowadays. The market is flooded with very diverse varieties, serving all tastes and budgets. The current combat for the conquest of the music producer’s ears is also creating a very positive outcome; hi-end studio monitors are ever more accessible. Now the consumer can get even greater quality for fewer bucks. This is exactly what I’ve experienced recently when I casually had the chance to try KAM Instruments’ Fidelio 6.5 HD Studio Monitors. KAM Instruments is a boutique audio gear manufacturer that creates a great variety of traditional as well as innovative studio equipment. This small company based in Illinois makes stage and studio microphones, such as the one-of-a-kind multi-capsule Condenser MC3, a beautifully designed microphone and instrument tube pre amplifier called Silver Bullet; revolutionizing guitars that are not only unique in look but also in capabilities (the HM1 allows the player to easily change pickup modules much like you would change a printer’s cartridge), and High Definition studio monitors that are great for the ear and easy to the pocket. 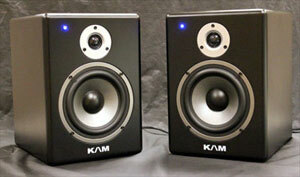 Here are a few words I would like to share regarding KAM Instruments’ Fidelio 6.5 HD studio monitors. Overview - On top of featuring a serious and bold look, The Fidelio 6.5 HD monitors come with quality and innovative attributes. It features a glass fiber enforced 6.5” woofer, thick composite wooden cabinet, elongated rear port that helps minimizes air movement noise and prevents interference between the low frequencies waves from port and woofer, and rounded corners that reduce boundary diffraction of high frequencies, widening its sweet spot. The Fidelio 6.5 HD monitors deliver up to 130 Watts of maximum power and have an overall frequency response of 41Hz to 20 KHz. They are designed to be use with an auxiliary sub woofer to achieve its best monitoring potential, having a sub filter on 40 Hz. Pros - I can’t consider what I’m about to say as a pro about the Fidelio 6.5 HD. In the end, a quality, clear, accurate audio translation is what every monitoring system is intended to produce, or sometimes, it claims to produce. With no disappointing surprises, the Fidelio gave exactly what I would expect, very transparent reproduction from low to high SPLs, with a crystal clear performance, especially regarding the high-end frequencies. What shocked me instead was when I got to check its price tag. That indeed it was a surprise. I have worked with monitors that are currently valued at similar price, and I found the quality of reproduction much superior with the Fidelio. Its reproduction can be easily compared with monitors that are currently a double of its price, I must say. And as we all know, a product that offers great quality and quite affordable price is certainly a consumer’s ultimate wish. Cons - I think the only flaw that I was able to find in the Fidelio 6.5 HD was its volume knob. Sometimes it is crucial being able to balance out the monitors’ volume depending of the environment’s characteristics or due to hearing circumstances. Being able to make such adjustments with precise accuracy is even more crucial. Unfortunately the Fidelio’s volume knob is the type that turns without offering such precision. I might be going a bit too crazy on this small detail, but in the end, what I always mainly look for when buying new audio gear is quality, precision and control. The volume knob threw me off a bit on the last two.